Aus der Reihe "Encyklopedia Okretow Wojennych" (Enzyklopädie der Kriegsschiffe) Vol. 50. 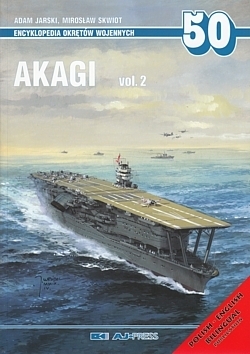 The publication gives an extensive description of all combat actions the aircraft carrier Akagi participated in, from the Pearl Harbor Attack to the Battle of Midway, in which the ship was sunk. 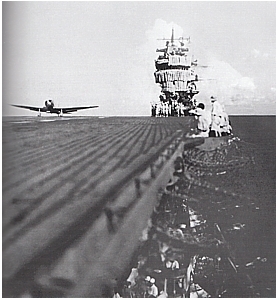 As aircraft carriers did not fight directly, the book concentrates on her and accompanying aircraft carriers' aircraft battles, as it is not possible to separate the actions of planes assigned to a particular aircraft carrier in the three greatest battles of the period - attack on Pearl Harbor, extensively described raid of the Japanese aircraft carriers on the Indian Ocean, or the Battle of Midway. Also other actions - attack on Rabaul, Port Darwin and Titiljap - are briefly described. 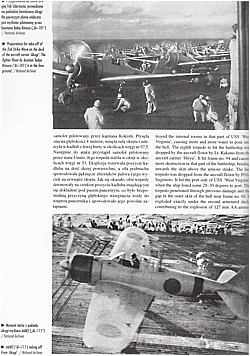 Organization of the Japanese naval aviation is given special attention, including aircraft-based aircraft (till mid-1942). The last chapter discusses all main types of aircraft based on the Akagi; all of them shown in pictures and some also in 1:200-scale planes. The publication is enriched by two bilaterally printed A1 sheets, presenting colour profiles and 3D views, showing the aircraft carrier in the initial (1928) and the final (1941/1942) periods of military service. Drawings of the aircraft carrier in 1928 configuration are also included, as well 3D views of armament and upper superstructure as in the Hawaii Sakusen and the Battle of Midway. Ein Heft aus der Reihe "Deutsche Luftkriegsgeschichte 1914-18". Paperback im Großformat mit 112 Seiten und vielen Abbildungen.